Derek Landy Blogs Under Duress: Woohoo! I've got nothing to say!! Ahem. Sorry. You probably read the title of this entry and thought to yourself "Ooooh he has good news that he's going to share with us!" Well, no. I mean, yes, I have good news, but no, I won't be sharing it quite yet. I have to wait until I CAN share it, you see? And before you all start thinking that this is about a Skulduggery movie- it isn't! It IS Skulduggery related, but it's not about a movie. But I can't tell you what it IS about. Sorry. Which leaves me with nothing to say. Er. How about a nice photo instead? I found this, bizarrely, somewhere on the internet. I have no idea where. But it shows a certain somebody- who may resemble a certain detective- in the days before the Bentley. Derek Landy! Pinch me I'm dreaming! No. Tis true..... I'M FIRST!!!!!!!!!!!!!!!!!!!!!!!!!!!!!!!!!!!!!!!!!!!!!!!!!!!!!!!!!!!! I'M FIRST IM FIRST IM FIRST!!!!! Will you read my Fanfiction 'Brother of mine'? It's on Fanfiction.net The author is Raven Quill Dipped In Ink. Is there a bug or something..... oh sorry Mr. Landy. Am I bugging you with my posts? Oh and love the pic! I feel like Fletcher Renn, constantly talking. But you don't understand. This is so cool! AHH! I'm finally on the first page!!! EEK! That's a weird photo... WHAT DO YOU HAVE TO SAY DEREK??? PLEEEEEEAAASSSSEE TELLL USSS!!!! @ Anya - we're waiting for our comment boxes to load. It's about freaking time you posted. I'm supposed to say something about Lenka. You remember her, good writer? I never met her. But I bet you remember being a young student and having a teacher, or maybe more than one, telling you to get your head out of the clouds and do your freaking homework already. Tell her not to listen. Like I said, I don't know her, but my friends care about her a lot, so I'm sure she's worth the effort. My goat died this morning in a freak accident, the baby. She had a lot of potential. I'm drunk now or I wouldn't mention, at least not on the first page of comments. Young impressionable minions: I don't recommend this. I can't go down stairs safely, and I'm still bawling my eyes out. Friends are good, though. Friends, not booze. Not the second comment. The first one. I did not 'LOL' at the goat. Sorry for any confusion. F"DEREK LANDY, SIR! WE NEED YOUR HELP. One of your minions, Lenka Sweet has been going through a lot lately. She has writen fanfic in the past and has a real gift for it. Over Christmas break her story was one that you read. But during that time and after, Lenka has been discouraged by many things, including a thoughtless teacher who made Lenka doubt her abilities and dreams. She has not really been on since then. Derek Landy. Could you please do a post in where you encourage her writing and encourage her to come back? I know you are very busy. But she is very important. Did you have any people who wouldn't believe in your ability when you were younger? "DEREK LANDY, SIR! WE NEED YOUR HELP. DEREK LOOK AT MAR-CHU'S POST!!! LOOK AT MAR-CHU'S POST!!!!!!!!!!! DO IT!!!! Goats have surprisingly human-like personalities. Not really coping well. She was a beautiful little girl. DEREK LANDY! IT'S ABOUT TIME YOU POSTED AGAIN! Have to maintain my purity after all. .....mar-chu....how many times are you gonna post that? DEREK LANDY, SIR! WE NEED YOUR HELP. YAY, Derek posted! Odd picture. Very odd. One of your minions, Lenka Sweet has been going through a lot lately. She has written fanfic in the past and has a real gift for it. Over Christmas break her story was one that you read. Can't stay too long, need to go to bed soon, but I'm glad to see you. I wish I could be there now to give you a hug in real life. Hang in there my friend. Ann - I'm so, so sorry. *hugs* I hope things start to look up for you soon. Okay. I'm tired. Night, all. NOW, I go to bed also. Goodnight Blogland! Er, you can stop posting this now...! I visited Lenka's blog, and she really seems to be having a lot going on. She's lucky that she has friends like you guys. Now I must go to sleep. My bed is calling to me. Hi Derek! I hope you consider reading my story. Tomorrow, perhaps? LOL Derek. Your bed and shower are wierd. Thanks for visiting her blog Derek! :D Bring her back to us PLEASE! I only read fanfiction at Christmas, I'm afraid! I collect a whole load of them and whole load of writers whose work I want to read, and I sit down over the Christmas break and indulge myself! I'll put your name at the top of the pile! Derek Landy! I will beg you to put Skylara's fanfic on top of your list too! Mar, you can stop now. Look at his new post. Derek you just made my year!!!!! Can't wait till Christmas now! Please don't forget. I just told a whole bunch of people! I want to be a famous author one day. JAIMY AND JACKY ARE SO ANNOYING!!!! Boy, Jacky sure has been close to death an awful lot in this book! Really having trouble with my comp. I have two new postings up on thePoetry bog. One post starts with a poem by Quinn. I would be honored if you read them. YEs she has! What did you thik of Mike Fink? I died laughing because of him. I'd love to read them! brb! Back! Amazing poems, Kal, I left comments on both! LOL I was just reading and got to the part right after the tornado when she climbs onto a floating tree in the water! LOL Love that part. The ever faithful sailor is dear Jacky! I loved Mike's tall tells! Yeah. Jacky tried to out do him but was beat at it. Imagine that? I loved the part where she does battle with the the outlaws in the cave and the indians! Still not loading well. Looks like will be like this until the end of the month. You guys still here? I'm glad you are here my friend. Yeah Skyril That play is AWESOME!!! Hi Skyril! how are you? Gah, I have to go! DEREK! YOU COMMENTED ON MY BLOG REVIEWS! I LOVE YOU SO MUCH!!!!!!!!!! I posted them just today and I was gonna wait till you posted on here to tell you, in the comment section, about the reviews and ask you to read them. And then YOU found ME, the blog I mean. Could you get anymore fantastic, any more psychic? I think not! And you left a COMMENT! A WHOPPER and just about the sweetest thing I've ever heard (especially from someone whose writing I criticized)! And then I noticed all these typos in the reviews and - here's the clincher - I could hardly manage to feel like an idiot at all, because I was so happy!!!! You rock! I wish we could have a real conversation about it all too, I so wish that! But the main things I want to say are: Skulduggery is absolutely allowed to act insane now and then, considering all he's been through. I'd understand if he acted insane ALL the time, considering all he's been through. But I love him because he's a good person IN SPITE of all he's been through. For a while, as I read Dark Days, I felt like it didn't make sense that, although he had just been through something horrible, he was just now acting insane when he'd been through horrible things back in the day too and still managed to act civil. But after thinking about it, I knew it was because the Faceless Ones were so recent that he was acting worse than usual. Still, I was worried because I have a habit of discovering books where the authors have this twisted sense of morality and they'll have psychotic characters and try to convince the readers the characters are just acting normal, and a lot of people seem to fall for it (*cough* Glee *cough*). I just had to know that you weren't doing that, that you knew Skul wasn't acting right. And you do know that, because you rock! Also, I'm sure I'll like the next books if only because all the books are well-written and exciting. I may not like them as much as The Faceless Ones, but once you hit a peak like that book, it's hard to top it. =) Lastly, I'm glad Skulduggery and Valkyrie will always be friends. They really were meant to be. Go ahead. My blog doesn't bite. Pleeeaase! That's bad news Skyril. This Queen before you says you should stay! just wanna know, in the case that skulduggery was made into a movie... would there be a video game based on it???? Going to check it out Minnie! OoooooOOOoooooh!A video game! What an intriguing idea! BRILLIANT! Love your pic! Very pretty! A video game is a pretty freaking awesome idea. Kal, waiting for that to load... probably should wait for it before I hit post here. Think Leona's loading stuff on her laptop. Minnie, Derek _is_ really damn cool, ain't he? Ann Marie, Derek's like CHOCOLATE! Yeah, earlier Skyril and I were talking about Bloody Jack. HAve you ever read any of the books in the series? Sorry for slow response. Keep getting distracted. Oh! I has gots to go to bed! Thank you for being so awesome and halping us out with a great friend! Hang in there. I pray you both and the rest of your family find peace and comfort during this sad time. I give all my sympathy to Lenka. I know that feeling when you start to doubt yourself. Also, the picture is great. 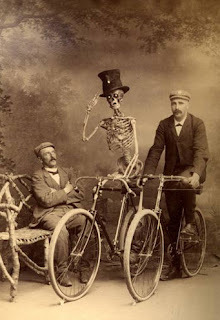 Didn`t know Skulduggery could ride a bike - and where the hell are his clothes?! And now I`ll just guess at what the good news could be. Hmm... you got a new, better offer for a book deal including 3 MORE books about Skulduggery for us and lots of money for you? Skulduggery is made into a graphic novel (that would be awesome)? June, Syvämiete, Cluainn, Valkyrie Wonna Be, I don't beleive we have met. oooh!!! It's the first day of Summer today! AND I'm on the first page of comments!! ...skulduggery's very own theme tune...? It could be he is releasing his book quicker than we expected? Maybe it IS?? It should be!! Releasing the book sooner would be AWESOME! I can`t wait to read it and the bookstore in my town is really quick when it comes to getting a book shipped all the way to Germany =) Like: one day and it`s there. Trollolololol. That's quite good. The bike is so quaint. The top hat is a nice touch. Why doesn't Skulduggery wear a top hat? I don't know why he doesn't wear a top hat... maybe it's not fashionable for undead detectives? Hello! Just thought I'd poke my head in... but I've got to be at my piano lesson... I'll be back, say 8pm? See you guys! Hope to see youback here Quinn. I only have one guess wich is you'r releasing the book quicker than we expected?